Biopower Systems is just one of the wave-energy developers gaining attention by meeting its technological goals and backing this up with investment support. Last month Biopower Systems everything was in place to test a 250 kilowatt wave power system that should be capable of powering 500 homes on King Island off the south-east Australian coast. This followed news earlier in the year that the company had been able to raise over $11 million for funding the pilot project from both government and private sources. 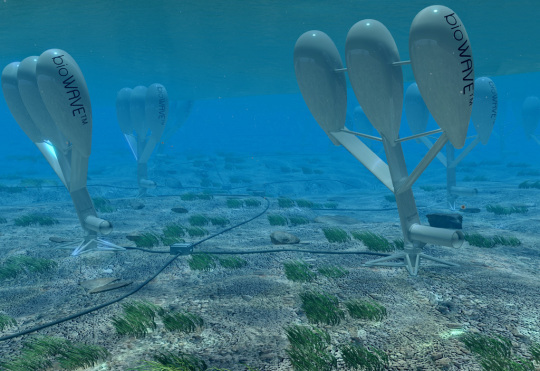 Biopower’s wave technology is inspired by nature and mimics the swaying motion of sea plants; its buoyant and bulbous finger-like structures generate energy from their hydrodynamic interaction with ocean waves. The company also has a tidal power generator is a technology based on mimicking swimming species such as sharks. The tailfin shaped device is fixed to the seabed of a tidal area and the passing water flow drives the resisting force of the generator. 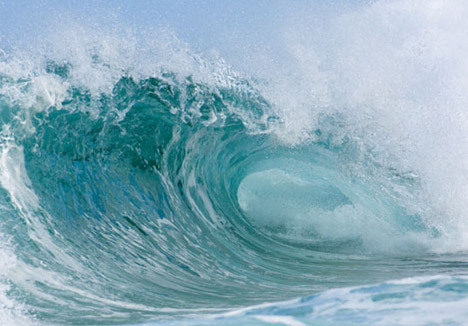 On the other side of the continent the Perth-based CETO Wave Energy is also mimicking nature to generate wave energy. The company is in the last year of a decade long development program and is currently looking for a site for its first large-scale commercial deployment. 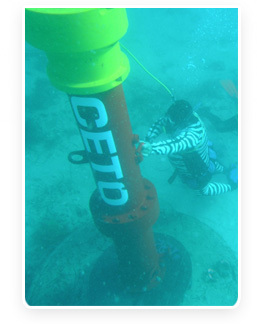 CETO’s technology is also fixed to the sea-floor and harnesses passing wave energy to operate what is essentially a positive displacement pump. This drives seawater to the shore under high pressure where it is then fed into a standard hydro-electricity generator. The beauty of these wave-power technologies is that they move with the power of the ocean rather than putting themselves in confrontation with it, like the some of the other wave power systems do. These first-generation technologies are generally one large solid unit that will always be subject to freak wave activity. The second-generation systems that operate under water not only get protected from the worst of a storm but are also smaller, lighter and modular units. Large-scale power supply is achieved by building up an array of the units to deliver the required power supply where it is required. Like other distributed systems, these types of wave-power technology reduce their risks by spreading them more widely. For an island country like Australia where the vast majority of the populace lives near the coast, virtually eliminating power transmission costs, the advantages of this type of power are many. CETO’s managing director Michael Ottaviano says that the bottom half of the country, from Brisbane to Perth is well endowed with a consistent and sizeable wave resource. He estimates the untapped potential is 500,000 megawatts, ten times the country’s current installed power capacity.